Last year at DubuqueFest we commissioned artist Tim Olson to create a community interactive art project. Tim created the “World’s Longest Panoramic Photograph of a Three-Day Art Festival” that features more than 600 festival goers! Ten months later we’re ready to unveil the portraits at an exhibit at the The Center for Dubuque History at Loras College in Dubuque. 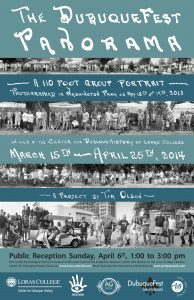 The exhibit features a 110 foot panoramic group portrait runs March 15-April 25. The public is invited to a opening reception on Sunday, April 6 from 1-3 p.m. at The Center for Dubuque History at Loras College, 1450 Alta Vista Street in Dubuque. The exhibit features a short documentary by filmmaker Tim Connery about the making of the panorama. Refreshments will be served and the artist will be on hand to answer any questions. 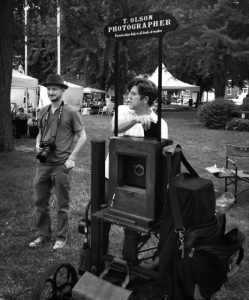 The panorama was shot by Dubuque artist Tim Olson and photographer Tony Moline on May 18th and 19th, 2013 in Dubuque’s Washington Park as part of DubuqueFest Fine Arts Festival. The photographers used a massive 1930s era studio camera. It was modified by metal worker Jim Avery so that it could be wheeled through the park. At 10 foot intervals, the photographers stopped and exposed a single sheet of black and white 5”x7” film. Over the course of the festival they photographed over 600 people on 220 sheets of film. Moline helped keep track of the subjects and gathered signatures which have been incorporated into the final print. He also used a digital camera to take in-between and background shots. After the festival, Olson processed the film then digitally stitched the single photographs together to create the seamless, 110 foot-long photograph on exhibit. The final print has the look of black and white panoramic photographs from the late 19th and early 20th centuries. A selection of historic older panoramic portraits from the Center for Dubuque History’s collection will also be a part of the exhibition.